I paid a fleeting visit to Castle Saunderson on the 22nd July, 2013. Wasn’t it designed by the same architect? The mansion is roofless and ruinous, alas; once the nucleus of a great estate in County Cavan. The Saunderson arms adorn a section of the wall. First published in July, 2013. Several years ago I drove to Drumbeg, specifically St Patrick's parish church. Drumbeg is a lovely leafy part of Belfast close to Sir Thomas and Lady Dixon Park. The little church itself is most photogenic and picturesque, with a large grave-yard on one side. 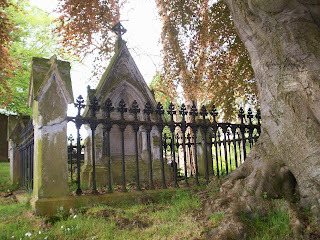 My purpose was to locate the family plot of the Weir family, who used to live at Killynether House in County Down. Seemingly they resided near Drumbeg prior to that, at a property called Oak Hill in Dunmurry, Belfast. In 1852, Arthur Collins Weir was a merchant who undertook business at his company, the Manchester Woollen Warehouse, 24½, Bridge Street in Belfast (would 24½ equate to 24a today?). His residence was 1 Albion Place. First published in March, 2009. Regular readers shall be cognizant that I seldom broadcast my opinion via the medium of this blog nowadays. An issue, however, has caused me some irritation, viz. the ability, or inability, of BBC Licence Fee Payers to watch BBC iPlayer abroad, legitimately. Of course we have VPNs. I am well aware of them. I do think it would be gracious of the Corporation to afford the reception of their iPlayer abroad to licence fee payers. They have been telling us for ages that they’re working on it. Well, Lord Hall, get a ruddy move on! 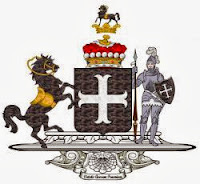 SIR FRANCIS GORE, Knight, of Artarman, County Sligo (fourth son of Sir Paul Gore Bt, of Manor Gore, and brother of Sir Arthur Gore, ancestor of the Earls of Arran). NATHANIEL GORE, of Artarman and of Newtown Gore, who wedded, in 1711, Lettice, only daughter and heiress of Humphrey Booth, of Dublin, by whom he had two sons and three daughters, viz. BOOTH GORE (1712-73), of Lissadell, County Sligo, who was created a baronet in 1760. Sir Booth married Emily, daughter of Brabazon Newcomen, of County Carlow, by whom he had two sons and a daughter. SIR ROBERT GORE, 3rd Baronet, who assumed, by sign manual, in 1804, the additional surname and arms of BOOTH. SIR ROBERT GORE-BOOTH, 4th Baronet (1805-76), of Lissadell, who espoused, in 1827, Caroline, second daughter of Robert, 1st Viscount Lorton, by whom he had no issue. He married secondly, in 1830, Caroline Susan, second daughter of Thomas Goold, of Dublin, a master in Chancery. Sir Josslyn Henry Robert Gore-Booth, 9th Baronet (b 1950); sold Lissadell House. The Lissadell Papers are deposited at the Public Record Office of Northern Ireland. 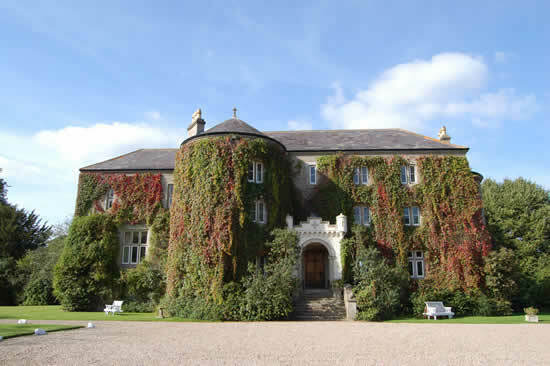 LISSADELL HOUSE, near Ballinful, County Sligo, was built in 1836,in the Neo-Classical Greek Revival style. It stands grey and austere on an eminence overlooking Sligo Bay, and at the foot of the magnificent Ben Bulben. There are no outbuildings to mar the simple, classical lines, and likewise no attics. The outbuildings are connected to the house by a service tunnel which runs from a sunken courtyard to the avenue and stable yard, and staff quarters are in the basement. The limestone was quarried locally at Ballisodare (location of Yeats’ Salley Gardens). Francis Goodwin was so proud of his design that it featured in his book Domestic Architecture (on display in the Gallery), the only private residence to do so. The entrance to the house is by the Porte Cochère, through which Ben Bulben is framed. The house faces Knocknarea, “That cairn heaped grassy hill where passionate Maeve is stony still”, and has magnificent views over Sligo Bay. Inside, the house is full of light and brightness – in the gallery, the bow-room, on the Great Staircase, and in the drawing-room. The drawing-room has stunning views of Ben Bulben, Knocknarea and Sligo Bay, and is now home to a remarkable series of AE paintings, and paintings by Paul Henry, Jack B. Yeats, Sir John Lavery, Walter Osborne, John Butler Yeats, Percy French and Humbert Craig. The bow-room has a wonderful collection of Regency books, reflecting the tastes of Caroline Susan Goold, who married Sir Robert in 1830. The bow-room, and a small suite of rooms behind, later served as the main living and sleeping rooms of the family of Gore-Booth siblings living in near poverty in the 1960s and 70s, when the remainder of the house was uninhabited. The gallery, formerly the music-room, has remarkable acoustics. It is oval in shape, lit by a clerestory and skylights and is 65 feet in length. It still has its original Gothic Chamber Organ made by Hull of Dublin in 1812, and also a walnut full size 1820 Grand Piano. The Gallery is famous for two superb suites of Grecian gasoliers by William Collins, a chandelier maker of the Regency period. The gasoliers were lit by a gasometer on the estate and as late as 1846 Lissadell was the only country mansion in Ireland lighted with gas generated locally at its own purpose built gasometer. The images on the dining-room pilasters were painted in 1908 by Casimir Markievicz, husband to Constance Gore-Booth. The ante-room was a favourite room of Constance Gore-Booth, and was known as her ‘den’. Indeed she has engraved her name on one of the windowpanes. This room is now home to many of her artistic works, including her sketch of the painter Sarah Purser, and her drawings of Molly Malone. The billiards-room contains the memorabilia collected by Sir Henry, 5th Baronet. The basement includes the servants’ hall, butler's pantry, kitchen and pantries, the bakery, wine-cellars, china room, butler's bedroom, housekeeper's room, and the maids' sleeping quarters. In 2003, Lissadell House was put up for sale by the then owner, Sir Josslyn Gore-Booth (a grand-nephew of the original Josslyn Gore-Booth), for €3 million. Despite celebrities showing an interest in the property, it was hoped that it would be purchased by the Irish state. 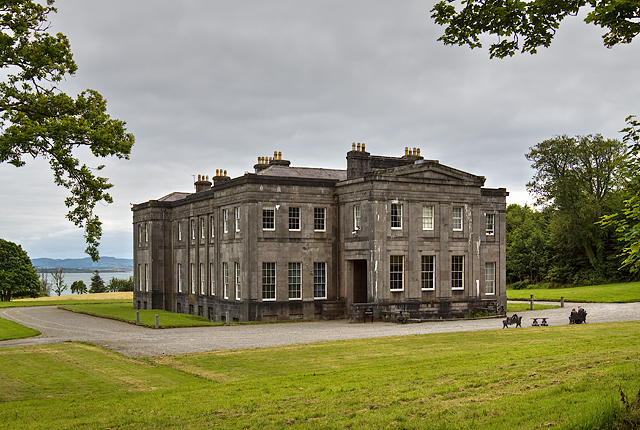 The Lissadell estate is now the home of Edward Walsh, his wife Constance Cassidy and their seven children. Writing about Lissadell for the Sunday Times forty years ago the BBC's Anne Robinson ('The Weakest Link') observed that "the garden is overgrown, the greenhouses are shattered and empty, the stables beyond repair, the roof of the main block leaks badly and the paintings show patches of mildew". After 60 years of neglect an intensive programme of restoration - without any public funding - has taken place in the House, Gardens, Stable Block and grounds since 2004 and Lissadell is once again a place of beauty. Click here for the text of Anne Robinson's article. No grants of any kind were made in respect of any part of the restoration, either for the house, the gardens or any part of the grounds. The new owners' vision was to transform the estate into a flagship for tourism in County Sligo and the north-west of Ireland, whilst providing a secure environment for their children and for visitors. They have stated that did not wish to exploit Lissadell commercially but to restore the house and gardens to their former glory, make Lissadell self-sustaining and protect this crucible of Ireland's historic and literary heritage. Other former seats ~ Huntercombe, Buckinghamshire; and Salford, Lancashire. First published in October, 2013. Select bibliography: LISSADELL HOUSE AND GARDENS WEBSITE. 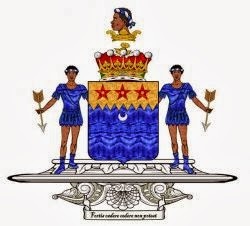 Gore-Booth arms courtesy of European Heraldry. THE PAKENHAM-MAHONS WERE MAJOR LANDOWNERS IN COUNTY ROSCOMMON, WITH 26,980 ACRES. Captain Mahon was granted Strokestown as a royal deer park, as one of the '49 officers. He was a captain in the Royalist Army, distinguished for his loyalty to the two CHARLESES, having fought in the English Civil War. He was High Sheriff of County Roscommon, 1664-76. THOMAS MAHON MP (1701-82), MP for the borough of Roscommon, 1739-63, and for the county, 1763-82. He was 42 years in the Irish parliament, and was Father of the House. MAURICE MAHON MP (1738-1819), who was elevated to the peerage, in 1800, as BARON HARTLAND, of Strokestown, County Roscommon. MAURICE, heir to his brother. MAURICE, 3rd Baron (1772-1845), in holy orders, who married, in 1813, Isabella Jane, daughter of William Hume MP, of Humewood; but dsp in 1845. MAJOR DENIS MAHON (1787-1847), of Strokestown, wedded, in 1822, Henrietta, daughter of the Rt Rev Henry Bathurst, Lord Bishop of Norwich. OLIVE HALES-PAKENHAM-MAHON, born in 1894, who married firstly, Captain Edward Charles Stafford-King-Harman, son of the Rt Hon Sir Thomas Joseph Stafford Bt, in 1914; and secondly, in 1921, Wilfred Stuart Atherstone, son of Colonel Herbert Marwick Atherstone Hales. LIEUTENANT-COLONEL NICHOLAS HALES-PAKENHAM-MAHON (1926-2012), was raised on the family's Roscommon estate and educated by a governess until he went to Winchester College. Because of the Troubles in Northern Ireland, where he had served in Londonderry during the rioting of the early 1970s as in the Grenadier Guards, he knew that he could not return to claim his inheritance of Strokestown House because his ancestry was known to IRA intelligence. 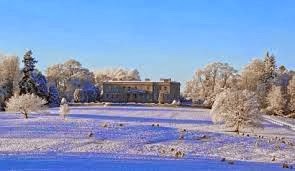 As heir to the property he convinced his ailing parents to sell the Palladian mansion, which was then in a bad sate of repair, in 1979 to Jim Callery of the Westward Garage group based in Strokestown. Strokestown Park now houses the National Irish Famine Museum. The Ordnance Survey Field Name Books record Thomas Conry as agent to Lord Hartland. In the 1850s Henry Sandford Pakenham-Mahon held land in the County Roscommon parishes of Dysart, barony of Athlone, Kilglass and Kilmore, barony of Ballintober North, Kilbride, Kilgefin, barony of Ballintober South, Cloonfinlough, Bumlin, Aughrim, Elphin, Kilbride, Kiltrustan, Lissonuffy, barony of Roscommon. Over 8,600 acres of the Mahon estate was vested in the Congested Districts' Board in 1911-12. STROKESTOWN PARK, Strokestown, County Roscommon, was built by Thomas Mahon MP (1701-82) on lands which had been granted to his grandfather, Nicholas, in the latter half of the 17th century. 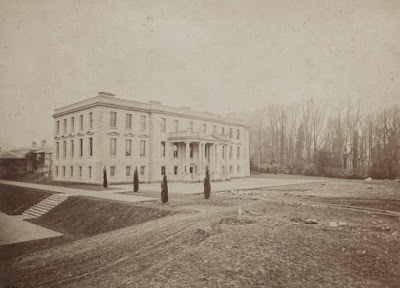 The family continued its association with Strokestown until 1979, when, eight generations later, Mrs Olive Hales-Pakenham-Mahon moved to a nursing home in England, at the age of eighty-seven. Bence-Jones states that the mansion consists of a centre block and wings, in the Palladian manner, the centre block being mainly 17th century and finished in 1696; though altered and re-faced during the late-Georgian era. It consists of three storeys over a basement and seven bays. There is a fanlighted doorway under a single-storey, balustraded Ionic portico. The wings are of two storeys and four bays, joined to the central block by curved sweeps as high as they are themselves; possibly added ca 1730. One wing contains a splendid stable and vaulting carried on a row of Tuscan columns. One addition at the rear of the mansion is a magnificent library with a coved ceiling and original 19th century wallpaper of great beauty. The entrance to the demesne is a tall Georgian-Gothic arch at the end of the tree-lined street of the town, one the Ireland's widest main streets. Apparently the 2nd Lord Hartland intended to create a street wider even than the Ringstrasse in Vienna. Strokestown's main street is the second-widest street in Ireland, after Sackville Street - now called O'Connell Street - in Dublin. The initial intention of Westward Garage was to keep the few acres they needed to expand their business and to sell on the remainder of the estate to recoup their finances. At that stage Westward was a young emerging company, with limited cash resources. However, when they spent some time in the house and saw what was there, they decided that Strokestown Park was far too important from a heritage point of view to risk losing it. They negotiated a deal with the Mahon family to ensure that virtually all of the original furnishings would remain at Strokestown Park. They also pleaded with the family to leave behind the documents that remained in the estate office. By doing so they had ensured the salvation of a huge part of the heritage of County Roscommon, particularly relating to the Irish famine. The first public role for the house was when it was used for the making of the film ‘Anne Devlin’, based on the 1798 Irish Rising, in 1984. What then followed was a restoration project of such enthusiasm and energy that it was to be acknowledged as the single best private restoration in the history of the Irish state. The house was opened to the public in 1987 and is "unique" in that it affords visitors the opportunity to browse through the public rooms on professionally guided tours, surrounded by the original furnishings of the house. The House is unchanged from the time when the Mahons lived there, as evidenced by photographs which can be seen in the house. 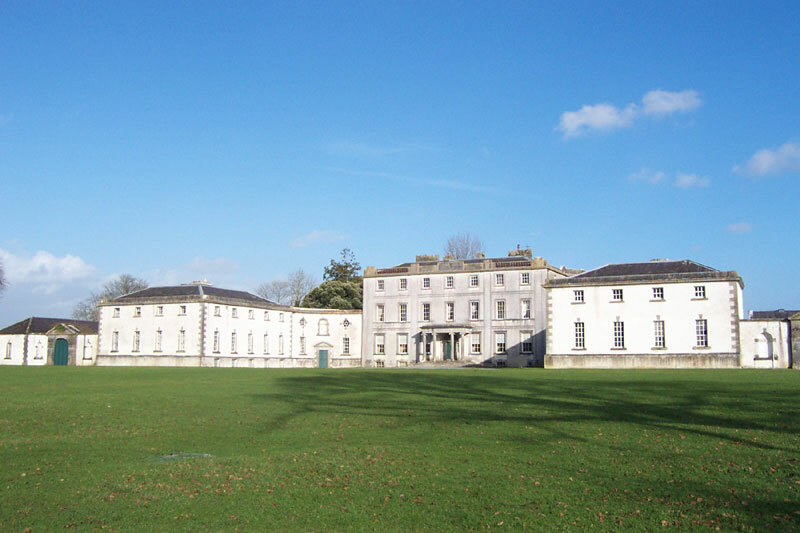 Strokestown Park is now open to the public as a visitor attraction. Former town residence ~ 35 St George's Road, Eccleston Square, London. First published in October, 2011. 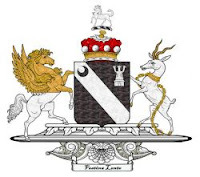 This family derives maternally from the extinct house of MOORE, Barons Moore, of Tullamore, and Earls of Charleville of the first creation, which sprang from a common ancestor with the Moores, Earls and Marquesses of Drogheda. THOMAS (Sir), of whom we treat. Sir Edward and Sir Thomas went over to Ireland, as soldiers of fortune, in the reign of ELIZABETH I.
THOMAS MOORE obtained by grant from the Crown, 1577, the castle of Castletown, with 758 acres of land thereunto adjoining, in the King's County, being styled in the said grant, "Thomas Moore of Croghan." Mr Moore received, subsequently, the honour of knighthood for his services against the Irish, by whom he was eventually put to death in his castle. SIR JOHN MOORE, of Croghan Castle, who, with other considerable territorial possessions, had a grant from the Crown, 1622, of the town and lands of TULLAMORE, King's County, to the extent of 1,147 acres. JOHN MOORE, of Croghan, who espoused a daughter of Sir William Sambach, Attorney-General for Ireland, but by that lady had no surviving issue. THE RT HON JOHN MOORE, of Croghan, MP for the King's County, who was called to the Privy Council by GEORGE I in 1714; and, in 1715, by the same monarch, was created Baron Moore, of Mellefont, County Louth. His lordship obtained a reversionary grant of the office of Muster-master General of Ireland. CHARLES, 2nd Baron (1712-64), appointed Privy Counsellor, Governor of King's County, and Muster-master-General in Ireland. The 2nd Baron was created, in 1758, EARL OF CHARLEVILLE. CHARLES WILLIAM BURY, born in 1764, was created Baron Tullamore, of Charleville Forest, King's County (2nd creation) in 1797. He was advanced to a viscountcy, in 1800, as Viscount Charleville. His lordship was further advanced, in 1806, to the dignity of an earldom, as EARL OF CHARLEVILLE (2nd creation). ... Charles William Bury (1764-1835) [was] a landowner of considerable wealth, derived partly from [Shannongrove], the Bury estate in Co. Limerick (where the family had settled in 1666), and partly from property in [and around] Tullamore, King's County, inherited through his father's mother, the only sister and heiress of Charles Moore (1712-1764), Earl of Charleville and Baron Moore of Tullamoore [as the Moores liked to call it]. He himself was created Lord Tullamoore in 1797, Viscount Charleville in 1800 and Earl of Charleville in 1806. The titles descended from father to son until the early death of his grandson, the 4th Earl, in 1874, who was succeeded by his uncle, the 5th Earl. 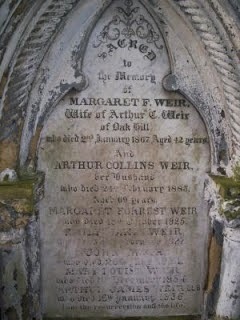 The 5th Earl died childless in 1875, when the titles expired. Lady Emily Howard-Bury, daughter of the 3rd Earl, married Kenneth Howard, son of the Hon James Howard. She succeeded to the Charleville estates, including Charleville Castle, on the death of her brother the 5th Earl in 1875 and in 1881 she and her husband assumed by Royal license the additional surname of Bury. The property passed in 1931 to her son, Lieutenant-Colonel Charles Kenneth Howard-Bury DSO JP DL. He was the leader of the first Everest expedition to find a route through Tibet to the North Col (1921), and is best known for that achievement. He is said to have abhorred Charleville Forest and stripped it of its contents at a now notorious auction in 1949. The Howard-Bury Papers are held at the PRONI. CHARLEVILLE FOREST, near Tullamore, County Offaly, is thought to be the finest and most spectacular early 19th century castle in Ireland. 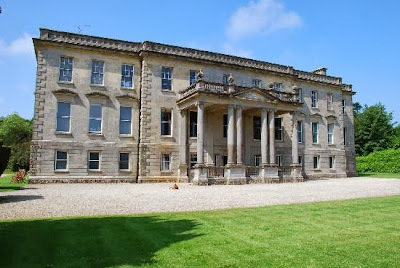 It was built between 1800-12 for Charles, 1st Earl of Charleville (2nd creation). The Castle is nestled among the huge and ancient oak trees that were once held sacred by the Druids. The building site was originally home to the Lynally monastic community, which existed as a part of the Durrow settlement. By the 1500s, the site was no longer ecclesiastical in nature, but used as a plantation settlement for the Moores. This thickly wooded acreage at the very centre of Ireland has been occupied through generational succession until the late 19th century. The castle itself, Ireland’s premier example of Gothic Revival architecture, was a work in progress from 1798 until it was completed in 1812. It was designed and erected in the style of a “tin soldier fortress” partly to commemorate Cornwallis’s victory over French revolutionary forces that had made their way into the Irish midlands. Following the death of the 5th Earl in 1875, the titles became extinct. Charleville passed to the sister of the 4th Earl; then to her son; and then to the grandson of another of the 4th Earl's sisters. 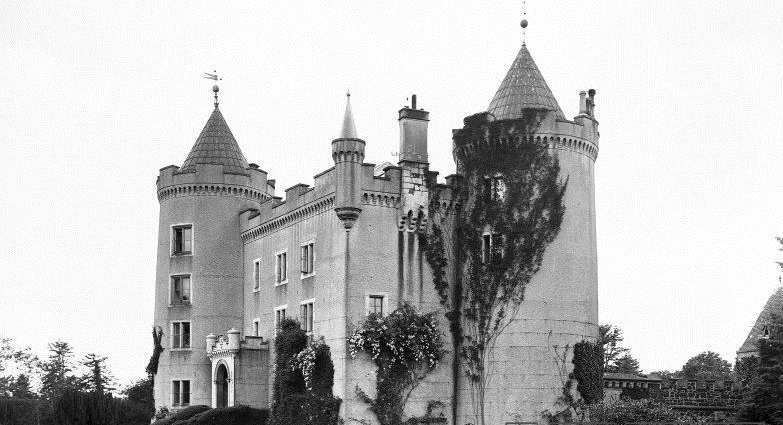 From 1912 until 1971, the unoccupied castle fell victim to the ravages of time. The years that followed the war for independence and the accompanying economic difficulties reduced the structure to a nearly roofless, ruined condition by 1968. The restoration and renovation work that was begun in 1971 by Michael McMullen continued under the supervision of Constance Heavey Seaquist and Bonnie Vance. The Castle is open to the public and is currently funded by a charitable trust under the direction of Dudley Stuart. It occupies 30 acres of land that includes gardens as well as densely wooded areas. The castle building was designed by Francis Johnston, and Charles Bury was the original owner. Johnston was responsible for several classic Georgian buildings in Dublin, including the General Post Office. The exterior of the building is dominated by stately turrets and a flag tower, and features many mullioned windows. A large window located above the main entrance is the focal point of the façade. Inside, the rooms are gigantic, including the dining room designed by William Morris that still bears its original stenciled wallpaper. The estate also includes a small outbuilding that resembles a gothic chapel and actually houses the kitchen and storage area. The stable yard is located just beyond this building. 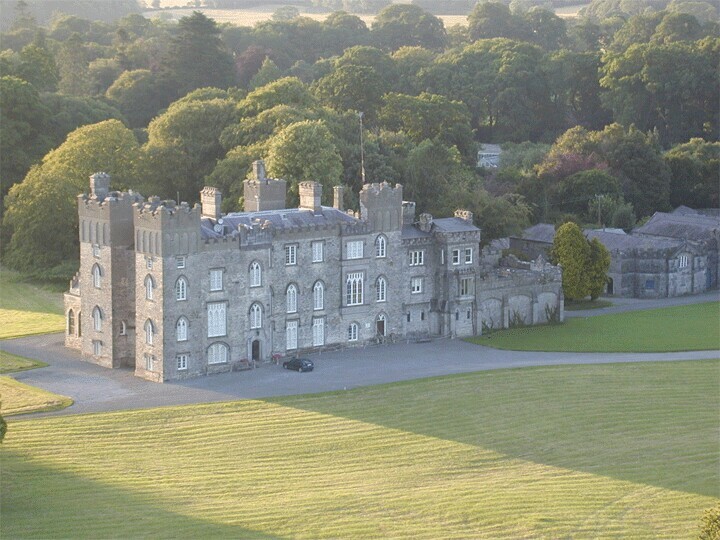 Lord Byron visited Charleville Forest Castle often and it is said that he held many parties here. The castle grounds are now the object of a massive restoration project that, when finished, will clear the area of overgrowth, discern the original plantings from the old English flower garden, and design and build new garden and relaxation areas for visitors. Volunteers are on hand to do this work from UK, France, the USA and Canada. They also assist in the regular maintenance of the property. The house and the surrounding grounds are said to be haunted by Druids and past occupants of the castle. It has been featured on several television programmes, including Most Haunted and Scariest Places on Earth. The huge staircase is reportedly visited often by the ghost of a young girl named Harriet, who was killed accidentally while sliding down the balustrade. Visitors have felt the chill of her presence while climbing the stairs, and have seen her ghostly figure skipping past. Sometimes, she is seen in the company of a small boy. Another haunting, reported by Bonnie Vance, included an early morning visitation of the ghosts of Charles Bury and Francis Johnston, accompanied by a large group of Druids. They appeared to be invoking a blessing upon Bonnie as she lay in her bed. Also, disembodied voices of two men have been heard as they spent the evening drinking at the castle, as well as children’s voices and shrieks in the empty playroom. Many of the visitors that arrive are paranormal experts, investigating the reports of various hauntings. People also come to attend a diverse range of events that includes plays, shows and auctions. Many ancient oak trees line the driveway. One of the largest is referred to as “King Oak”. Legend says that a member of the Charleville family has died every time the tree lost a branch to weather or old age. Colonel Howard-Bury died in 1963, two weeks after the tree was nearly destroyed by a lightning strike. First published in September, 2011. 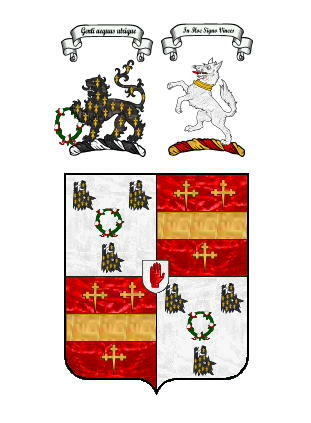 Charleville arms courtesy of European Heraldry. The name MADDEN or O'MADDEN is among those which claim descent from the Milesian colonizers of Ireland. THOMAS MADDEN, of Bagottsrath, near Dublin, comptroller to Thomas Wentworth, 1st Earl of Strafford, Lord Deputy of Ireland, was eldest son of John Madden, of Bloxham Beauchamp, Oxfordshire, and brother of Robert Madden, of Donore, County Dublin, ancestor of the Maddens of Meadesbrook, and, in the female line, of Oliver Goldsmith, the poet. He married Elizabeth, heiress of William Pettiver, of Middleton Cheney, Northamptonshire. JOHN MADDEN (1598-1661), of Maddenton, County Kildare, and Enfield, Middlesex, one of the attorneys of His Majesty's Court of Castle Chamber, and general solicitor for parliamentary sequestrations, 1644-49. He espoused, in 1635, Elizabeth, daughter and co-heiress of Charles Waterhouse, of Manor Waterhouse, County Fermanagh. DR JOHN MADDEN (1648-1703), of Manor Waterhouse, County Fermanagh, who wedded firstly, in 1680, Mary, daughter of Samuel Molyneux, of Castle Dillon, County Armagh; and secondly, Frances, daughter of Nicholas Bolton, of Brazeel, County Dublin. THE REV DR SAMUEL MADDEN (1686-1765), of Manor Waterhouse, Rector of Newtownbutler, County Fermanagh, who was one of the founders of the Dublin Society, and a great benefactor to his country, known in the family as "Premium" Madden. JOHN MADDEN, of Maddenton, County Monaghan, High Sheriff of County Monaghan, 1750, who wedded, in 1752, Anne, daughter of Robert Cope MP, of Loughgall, County Armagh. Catherine; Anne; Charlotte; Maria Alicia. JOHN MADDEN JP DL (1837-1902), of Hilton Park, and of Manor Waterhouse, who married, in 1864, Caroline, daughter of the Rev and Hon Nathaniel Clements. LIEUTENANT-COLONEL JOHN CLEMENTS WATERHOUSE MADDEN JP DL (1870-1935), High Sheriff of County Monaghan, 1906, and County Fermanagh, 1909, who wedded, in 1908, Agnes Mary, third daughter of Sir William Henry Tate Bt, of Highfield, Woolton, Lancashire. JOHN WILLIAM RYDER MADDEN (1913-1996), of Hilton Park, Major, Irish Guards, who married, in 1937, Nita, daughter of Brigadier J Seymour Mellor CBE DSO MC. 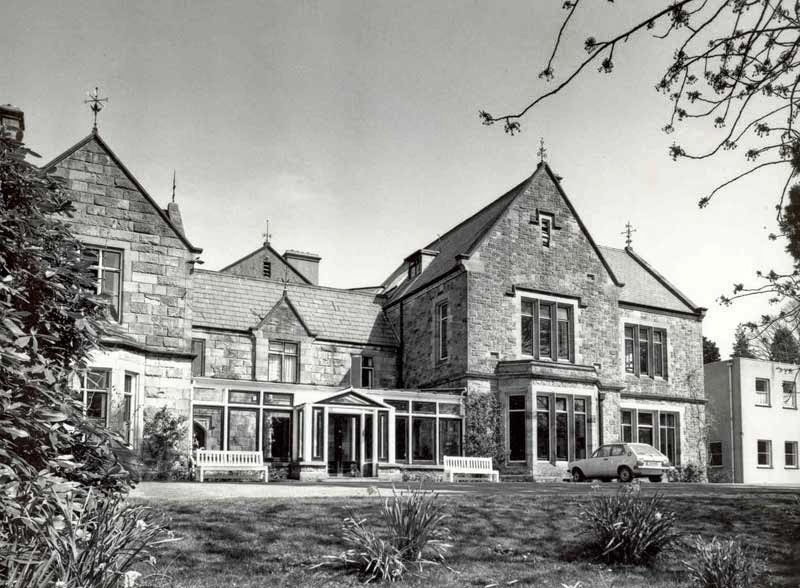 Major Madden's son and daughter-in-law, Mr and Mrs J S D Madden (who made significant additions to the deposits in PRONI), opened Hilton as a 'Hidden Ireland' country house establishment. Hilton Park is today run by the seventh generation of the Madden family, Fred and Joanna Madden, and Fred's sister, Laura, with her family. The estate still extends to over 600 acres, much of it woodland, and provides a remarkable natural habitat for flora and fauna. HILTON PARK (formerly Maddenton), near Clones, County Monaghan, is a noble house, built in 1734, comprising two storeys over a basement. It has an eleven-bay entrance front, the five central bays of which break forward. Hilton Park House was rebuilt, having suffered a fire in 1804. In 1872, the basement was excavated to become the ground floor and the house was re-faced in Dungannon stone. A fine Ionic porte-cochère was added, with coupled central columns. Hilton Park, as we see it today, is the work of noted church architect William Hague, for Colonel John Madden. Classical influences are evident in the elaborate portico and symmetry of the façade, which was developed from a simple two-storey Georgian house when the ground around the basement was excavated, and the evolution of the house is testament to the power and stature of the Madden family. A variety of timber sliding sash windows is retained throughout, articulated by dressed sandstone detailing. The large porte-cochère is the dominant feature of the building and amply articulates the entrance. The various additions to the rear enhance the building and reflect the changes over the building's history. Prominently set within extensive parkland among related demesne structures, Hilton Park is a relatively complete demesne landscape. CABIN HILL, Upper Newtownards Road, Belfast, is a fairly large and considerably extended two-to-four storey house, built around a sandstone Tudor-Revival gentleman’s residence of ca 1860, itself extended in similar style ca 1903-5. A large, modern, flat-roofed, four-storey, rendered block was added to the rear by the school in 1946 with an adjacent, equally large and equally modern, brick wing of about 1980. When it was built, Cabin Hill was originally closer to the village of Dundonald - or, indeed, Knock - than the city of Belfast. This small farm in the townland of Ballycloghan was adjacent to the Belmont estate and the Clelands' Stormont estate. The name Cabin Hill refers to a "cabin" built in 1786-7 by Samuel McTier and his wife Martha, on a small parcel of land they had acquired for £50 (about £6,700 today). The house itself, as the name implies, was a single storey, thatched dwelling; however, a painting of 1847 shows that, by the standards of the day, it had a fairly prosperous appearance, being relatively large and prosperous looking ~ not the "cabin" one might have expected. After Samuel McTier's death in 1795, Martha continued to use Cabin Hill as a country retreat, being joined on frequent occasions by her brother, the Belfast radical and founder of the United Irishmen, Dr William Drennan. 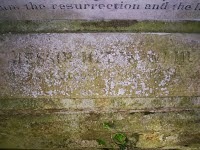 Drennan died in 1820 and Martha in 1837; however, the property appears to have been disposed of some time before the latter date, for in the 1833 valuation it is recorded as the home of a Mr Tomb. By 1852, it had been acquired by John Dinnen, a Belfast solicitor. Dinnen appears to have retained the original house for some years, though, by 1861, a new, much larger building appears to have been built. 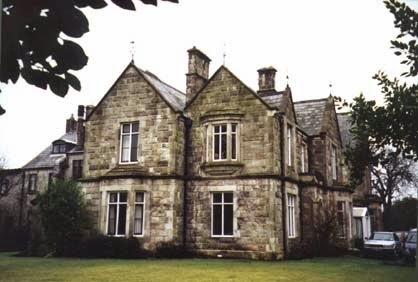 This new dwelling, a two-storey gentleman's villa in the Tudor-Revival style, remained in possession of Dinnen's descendants until 1903, when it was acquired by Robert James McMordie QC, Lord Mayor of Belfast. About 1903-5, McMordie greatly extended the house by adding the large section to the eastern side and the new entrance conservatory, all to designs by Hugh Brown. Mr McMordie died at Cabin Hill in 1914. 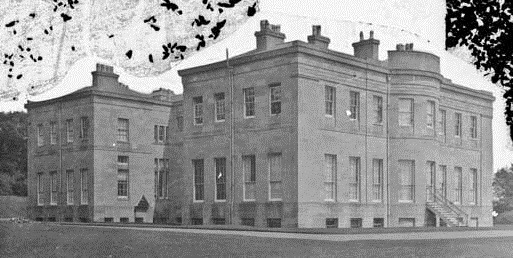 Between, 1920-22, his widow leased the property to Sir James Craig (afterwards 1st Viscount Craigavon), the first Prime Minister of Northern Ireland. Several cabinet meetings were held at the house. In 1924-25, McMordie's widow sold Cabin Hill to Campbell College, which converted it for use as their preparatory school. Ca 1935, the school added a porter's lodge to the main gateway and, in 1946, the large four storey modern style wing was added to the rear of the main building itself. Further separate classrooms were built to the north east side of the building in 1973, with a further modernist extension added to the main school later. These books give no indication of major building work at Cabin Hill between 1864 and the McMordie extension of ca 1903-5, suggesting that the original section of the Tudor Revival house is pre 1864. First published in May, 2014. Today has been one of those special days in the British calendar of events, viz. the safe birth of a healthy new Prince of the United Kingdom; and two new appointments to the Most Noble Order of the Garter. I am naturally overjoyed for TRH The Duke and Duchess of Cambridge; Her Majesty, who has another great-grandson; and the Royal Family as a whole. Of course I had no idea that Alan, 3rd Viscount Brookeborough, would be appointed to the Garter. His grandfather, Sir Basil Brooke Bt, the 1st Viscount, was installed as a Knight of that Most Noble Order in 1965. Now we have two Knights of the Garter resident in Northern Ireland, namely James, Duke of Abercorn, and Lord Brookeborough. I send cordial congratulations to Lord Brookeborough on what is the highest order of chivalry in this kingdom. The Abercorns and Brookeboroughs have a distinguished and honourable record of dedicated service to sovereigns and the crown. The family of PLUNKETT is supposed (claimed the historian Sir Richard Lodge) to be of Danish extraction. The time of its first settlement in Ireland cannot be decidedly ascertained, but it was certainly as early as the reign of HENRY III. It has extended into many parts of Ireland (particularly the counties of Meath, Dublin, and Louth), and three distinct peerages have been enjoyed by different branches, viz. the earldom of Fingall, and the baronies of Dunsany and Louth. JOHN PLUNKETT, the earliest of the name on record, appears to have been seated, towards the latter end of the 11th century, at Bewley, or Beaulieu, County Louth, where he died in 1082. From him descended another JOHN PLUNKETT, who lived in the reign of HENRY III, and had two sons, John, ancestor of the Barons Louth; and RICHARD, ancestor of the Earls of Fingall; and Baron Dunsany. SIR CHRISTOPHER PLUNKETT, Knight, grandson of the above-named Richard, was deputy to Sir Thomas Stanley, Lord Deputy of Ireland, in 1432, and subsequently under Richard, Duke of York. CHRISTOPHER (1410-63), that of Dunsany, of which he was created, in 1439, BARON DUNSANY. ROBERT, 5th Baron; one of the peers of the parliament held at Dublin, 1541, when he was ranked immediately after his kinsman, Lord Killeen. His lordship wedded firstly, Eleanor, youngest daughter of Sir William Darcy, Knight, of Platten, vice-treasurer of Ireland, bt whom he had four sons and nine daughters. He married secondly, Genet, daughter of William Sarsfield, alderman of Dublin, and widow of Mr Alderman Shillenford, by whom he had two other sons. PATRICK, 9th Baron (1595-1668), who received a patent of confirmation, from JAMES I, of the several castles of Dunsany, Corbally, etc. His lordship was subsequently summoned to parliament in the reign of CHARLES I, and suffered considerably in the cause of that unfortunate prince. A short time before 1541, the Lords Justices and supplied the lords of The Pale with arms, but suddenly recalled them, which occasioned much discontent among the Catholic peers, who, having assembled, appointed Lord Dunsany to assure the justices of their attachment and loyalty, and of their readiness to co-operate in every measure that could be conducive to the peace of the country. The Lords Justices, however, took no further notice of the proffered service than by confining his lordship in Dublin Castle, where he remained for several years; but on the restoration of CHARLES II, he again took his seat in the House of Lords, and continued to sit until 1666. RANDALL, 11th Baron who, adhering to the falling fortunes of his legitimate sovereign, JAMES II, was outlawed in 1691; but being included in the Treaty of Limerick, his estates were restored; neglecting, however, the forms necessary to re-establish himself in the privileges of the peerage, neither his lordship nor his immediate descendants had a seat in the House of Lords. His lordship married firstly, Anne, widow of Theobald, 1st Earl of Carlingford, and daughter of Sir William Pershall; but by that lady had no issue. EDWARD, 12th Baron (1713-81), who conformed to the established church, but took no step to confirm the barony and his right to a seat in the House of Lords. RANDALL, 13th Baron (1739-1821), who claimed, in 1791, and was allowed his seat in parliament. He wedded secondly, in 1800, Emma, sister of Sir Drummond Smith Bt, of Tring Park, Hertfordshire, though had no further issue. EDWARD WADDING, 14th Baron (1773-1848), of Dunsany Castle, County Meath. Randal, 21st Baron (b 1983). The heir presumptive is the present holder's brother, the Hon Oliver Plunkett (b 1985). DUNSANY CASTLE, Dunsany, County Meath, is a modernised Norman castle, begun ca 1180-81 by Hugh de Lacy, who also commissioned Killeen Castle, nearby, and the famous Trim Castle. It is possibly Ireland's oldest home in continuous occupation, having been held by the Cusack family and their descendants by marriage, the Plunketts, to the present day. 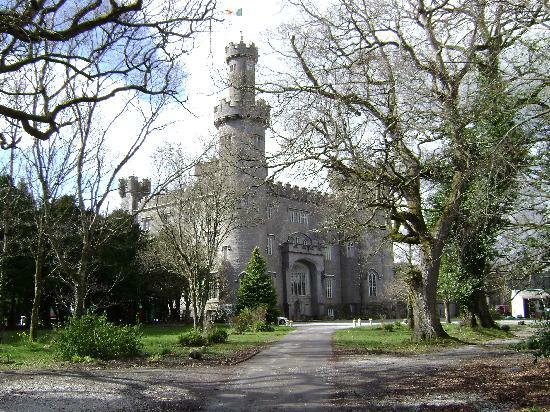 The castle is surrounded by its demesne, the inner part of the formerly extensive Dunsany estate. The demesne holds an historic church (still consecrated), a working walled garden, a walled farm complex, an ice house, various dwellings and other features. Dunsany castle was built, probably in succession to basic "motte" fortifications, remnants of which can still be seen to the left and right in front of it, in the period 1180-1200, construction being thought to have begun in 1180-81. Foundations and the lower parts of the four main towers are thought to be original, and some interior spaces, notably an old kitchen, but much additional work has been carried out, especially in the 18th and 19th centuries, and the current castle is more than three times the size of the original. 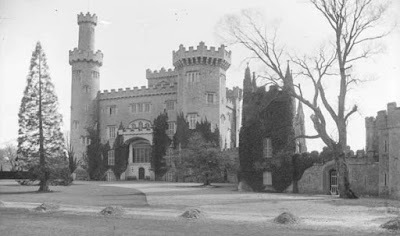 The castle, along with Killeen Castle, was held by the Cusacks, initially on behalf of the de Lacys, and passed by marriage in the early 15th century to the Plunketts. 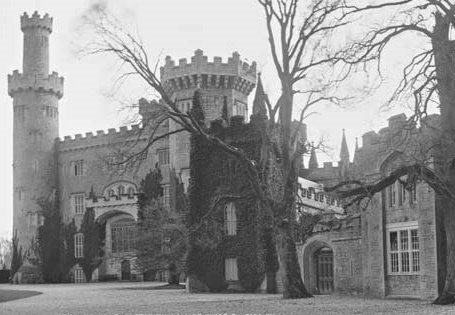 Originally, it and Killeen lay on a single estate but the first generation of Plunketts gave Killeen to the eldest son, and Dunsany to the younger, Christopher, following which the estate was divided, and the Castle descended in the hands of the Barons of Dunsany, who enjoyed almost uninterrupted ownership, aside from issues around Oliver Cromwell's operations in Ireland (the then Lady Dunsany defended the castle against an initial approach but the family were later forced out, some dying on the way to Connaught), and the aftermath of some other troubles between Ireland and England. They were cousins of St Oliver Plunket. The Dunsany estate was reduced by the operation of the Irish Land Acts in the late 19th and early 20th century, but the castle is still surrounded by its original demesne, and other estate lands remain around the district, some adjacent to the demesne and some remote. Much of the work of the writer Lord Dunsany (18th Baron) was done at the Castle, notably in a room in one of the building's towers. Dunsany Castle is entered through a projecting porch and a lobby with a worked plaster ceiling, which opens into the central hallway, featuring the principal stairway and a vaulted ceiling, and into a secondary hall. The ground floor holds the grand dining-room, with portraits of past family members, and a fine arts and crafts billiards-room, as well as kitchen spaces, ancient and modern, and other rooms. On the first floor are the library, and drawing-room, which has Stapleton plasterwork from 1780. The library, which may have been worked on by James Shiel, is in the Gothic-Revival style, with a "beehive" ceiling. Also on this floor is a secondary stairway (where a "priest's hole" for hiding Catholic ministers formerly existed). The third floor holds ornate bedrooms. There is a full-scale walled garden, over 3 acres in size, still producing fruit and vegetables for the estate. A cottage, historically occupied by the head gardener, is built into the walls of the garden. Also within the demesne are stone-built farm and stable yards, an ice-house and wells. There is a home within the stable yard, and at least one ruined cottage near the walls. 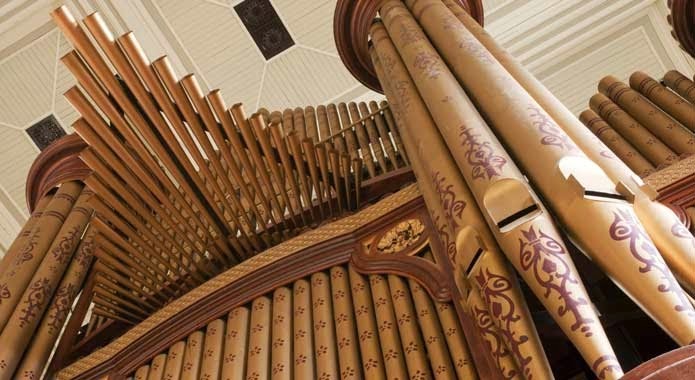 The Mulholland Grand Organ is probably the largest of its kind in Northern Ireland and one of the oldest examples of a functioning classic English pipe organ. It was named after Andrew Mulholland, of Ballywalter Park, Mayor of Belfast, 1845, who donated it to the hall in the 1860s. The organ was built by William Hill & Son and donated after the hall was officially opened. In the late 1970s, the organ was extensively restored to Hill's own original design. Andrew Mullholland's great-great-grandson, Henry, 4th Lord Dunleath, oversaw its restoration. Let’s face it. There are some things in life which really count and when it comes to the size of your organ, in the mind of the Victorians at any rate, size mattered. And it still does - although with modern technology, you can probably produce the same effect of a huge organ from a mere box of tricks and a couple of big speakers. Thanks to the size of the trouser pockets of a previous Mayor of Belfast, the generous Andrew Mulholland, this city can claim one of the most interesting old organs in the country. So when the Mulholland Grand Organ was 'welcomed back' to the Ulster Hall this week and 'tried out' by the current city organist, Colm Carey, I decided that I should get in on the act. Why not interview the organ itself? It’s no joke having your ivories tickled at almost 150 years of age. And especially after all that I’ve been through in this past year. Those rough builder types who refurbished the Ulster Hall, I tell you. Despite the swathes of black plastic that had been wrapped around me, I could feel the damp, the dust, the debris getting into my inners. It almost did for me! At that point, there was a low grumbling from the depths of the organ casing and the beginnings of a cipher so I thought I’d better move the conversation on. We wouldn’t have wanted to disturb the political rally that was taking place in another part of the Ulster Hall complex – making any sounds to do with the arts would, of course, have been unwelcome. Ah yes, I’ve seen a few things here you know. Rallies were ten a penny in the old days but there’s just not the same calibre of politicians nowadays as back then. In the old days, they were already rich from exploiting the poor of the country – now they spend all their trying to make themselves rich in other ways – questionable expenses, dodgy land deals, you name it. That’s the new fanfare trumpet which was added some years ago by Mr Prosser – the lovely organ builder who looks after me so well. Mind you, I’ve noticed he’s got rather portly of late and finds it a bit awkward crawling around inside me and reaching those bits which require someone – how shall I put it? – someone of a lighter frame perhaps? That fanfare rank is not the easiest place to reach... still, he manages it rightly and, of course, no-one ever uses it now anyway – those tone deaf City Council bureaucrats probably consider it a Health and Safety risk for the audience as it certainly makes one big sound. But the trumpet fanfare is just the bit 'in your face', I suggested. What’s behind the facade? You’ll already know that I’m made up of over six thousand pipes – the biggest is 32 feet long and the smallest is no more than half an inch. I’ve got four keyboards or manuals and it takes a six horse power engine to work the bellows that supply me with enough air to sing. In fact, I’ve also got a back-up two horse power engine as well because when you pull out all the stops – and there’s well over 80 of those – you need one heck of a lot of wind. I remember that nice girl Gillian Weir playing with me in the Saint-Saëns Organ Symphony here some years ago and that last chord began to sag ever so slightly – well, it happens. Now she was one big player! And talking about big players, there was the infamous Carlo Curley also who actually stood up on my pedal board for melodramatic effect. He knew how to play to the gallery and that’s no lie. In those days, the hall manager, Terry de Winne, had installed a massive spotlight up there, trained only on me so that the ice-cream parlour colours that he’d 'restored' were almost blinding. Funny how one generation thinks it 'restores' what a previous generation has already thought it 'restored'. Like many old codgers, I’ve had various bits and pieces added and fall off over the years – some to good effect and, well, others which could be removed without too many tears being shed. I think I’d want to go back to my original specification and get rid of some of the excesses of my 70s rebuild. That would cost a bit I’m afraid but I’d love to be again the sprightly young romantic organ I was when Mr Hill put me together in 1862. A celebratory concert to mark the Mulholland Grand Organ’s return to working order was held on Tuesday, the 4th May, 2010, featuring the Belfast City Organist, Colm Carey, and the Ulster Orchestra. First published in April, 2010.